COLOR: Green with Darker Green Stripes HARVEST: 75 Days PLANT HEIGHT: 6 - 12" . . . PLANT SPACING: 5 - 6' LIGHT REQUIREMENTS: Sun . . . 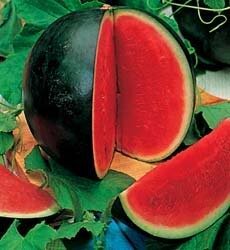 SOIL / WATER: Average - Dry (Tolerates Drought) Sugar Baby produces small round 8 pound melons that measures 7 - 8 inches. It has very few seeds, is fine textured, and is very sweet! It attracts bees, butterflies, and birds.